Officers took to Facebook to reveal that they had finally caught up with the evasive junkie. They said the man had been “avoiding us this long time”. The PSNI said the man had been released from prison on licence, however he had continued to offend. His licence was then revoked, meaning he had to be returned to prison. Last week the long arm of the law finally caught up with him. “He was giving us the slip, ‘lying low’ as we thought,” said the PSNI. “Turns out he was lying ‘high’ quite literally! 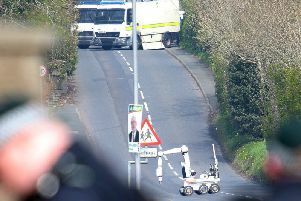 “In an attic busy growing this gear!,” the PSNI posted on Facebook. “And he will be going to jail, directly to jail, and not passing go! “Before being returned to prison he will be sampling the inside of our cells as he has been arrested for possession of drugs and possession with intent to supply offences,” said the police. “A 23-year-old woman has also been arrested and is in custody too. “Great to see drugs and an offender taken out of the community,” said PSNI Craigavon.